When we lived on our Rancho, a 2 acre rustic oasis where we played at being farmers, there was a big water trough that was left by the previous owners. I got a lot of help dragging that thing up from the pasture and over to the garden by the chicken coop. Geoff drilled some drain holes into it and then hooked it up to our irrigation system. I filled it with mulch and compost and dirt and seeds, and it wasn't long be before we had an elevated and healthy, drip-irrigated garden. Can you see Rosie, our Rhode Island hen...? she's stepping on one of the granite rocks that encircled the play area. Alex and his great grandmother were sitting in the garden together. I miss sharing our home with her, enjoying her good company. Behind them is the yard where Rosie and Gracie and Luna lived... a chicken estate, complete with hanging art and water features. We made it very classy. We planted fig trees and guavas and jacaranda, and lots more. I really miss the fig trees. And the lime tree. And the lemon tree. Oh, and do I ever miss these girls, my Chicas! This is Luna, was Luna. We named her for the white moon on her chick bottom. Her moon disappeared, replaced with spots and stripes. She did retain her docile and sweet baby chicken nature. She was an easy going kind of hen. 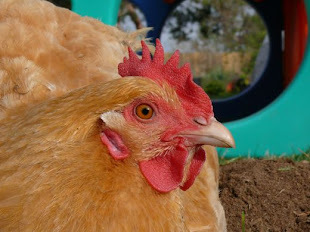 Now Rosie was a nice hen, and we loved her, but I would not call her sweet and docile. She had more of an attitude, an agenda that focused on laying, scratching, eating and staying alert. Here's my first baby girl. My tender, gentle and affectionate Gracie. We thought she was such a dainty, feminine chick, that "Gracie" was perfectly suitable to her person. Her name matched her lovely plumage and the wispy down that framed her pretty face. Gracie, like her sisters, would come when called, and then she would sit on my lap and let me scratch around her neck and pet her soft back. She would fall asleep in my arms. Sigh. We grew carrots in the water-trough garden conversion, and were those carrots ever happy. They were sweet and ginormous. I remember we would pull just one up and cut potato chip size slices for a snack. Crisp and delicious. We also juiced a lot of carrots. My favorite recipe was garden fresh carrots and beets, with lime and ginger, sometimes apple too. So yummy! I was just browsing my photo library. I thought it would be a quick glimpse of days gone by, but some of these just had to be dusted-off and brought out of hiding. Diego, resting in an empty cereal box. I have never known a more mellow cat. He would sleep in the car! He came with us on a drive to Wisconsin and on another road trip to Oregon. It was awesome, really. I wish I had a picture of him in Custer State Park, where we were getting snowed-in and buffalo (bison, right?) were blocking the road. Diego stood on the dashboard to take in the spectacle. Our Rancho didn't always look this good. Getting it this beautiful was one big labor of love. When we bought it, it was a sadly neglected house with no landscaping whatsoever. I read the entire Sunset Western Gardening Book twice and then designed a landscape and chose all of the plants. We hired Nacho and Victor to execute my visions, and wow, what an adventure that was. Maria would have loved the Rancho, the big sky and the fresh fruits growing all around the house. I think she would enjoy wearing cowgirl boots and a hat, like her momma. She would love the Chica round-up, leading them home for a night's rest. ...fig and guava tress and big sky and...wow, you've already lived in heaven here on earth! I loved your post about the Rancho. I lived in La Habra Heights for 15 years, and live in Missouri now. I live Rural but there is lots I miss. Mostly I miss my Chickens too. I had to find them all homes when we moved here. I loved your trip down memory lane it connected me to Ca and what it was like when I lived there. Thans again for sharing a bit of your world Past & present. when i was a little girl we lived for a time, in Los Altos. We had Peruvian Hens, and a Peruvian Rooster. The hens were sweeties, but the Rooster, Alfonzo, was MEAN! We used to peek around the corner to make sure he was on the other side of the yard before we would enter, otherwise he would chase us! I type 41 words per minute. See, the Internet is good for something! What a lovely post Natalie, nostalgic, affectionate, illuminating and pre-Maria! El Rancho looks gorgeous. DO you have nay links that explain how you became el-Rancho-less? I know you're looking for a house to buy, and deciding which state that should be in, but did you own El Rancho? What changed? Don't wanna be nosy, but curious about it. Feel free to tell me to mind my own business. Loving the chickens too, we had a "Chook Hilton" where our Pokemon-inspired named chickens led a good life after we rescued them from a battery egg farm. They were rusty reds (well, not initially, they were originally half bald wrecks about a year old), and our pets too. They soon grew to look much healthier. Ahh, just found the archived sections of American Dream and it has filled in a bit of background, of years of looking.BUt it raises a few other questions. How did the non-violent PSP game work out? I thoroughly approve the concept. Wow the Rancho looks gorgeous! And you had real chickens in a backyard too?! Excellent! I bet they laid the best eggs. My great-grandparents once had a chicken farm in the valley. This was way before I came along. In fact I'm not sure if my mother knew my father yet. Beautiful, just beautiful. No wonder you pine! Someday, again, even more wonderful (with even more chickens). Hey, you should be GLAD your typing speed is what it is, because it means that you haven't spent large chunks of your day all day working in front of a computer and typing all day! THAT'S the sacrifice it takes to get fast and you don't even want to think about that! I have never seen such good-looking chickens! that you MUST go and check out. I immediately thought of you and your chicken "thang".